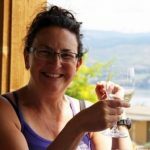 Donna passed away peacefully surrounded by her loving family, after a year-long battle with cancer, on June 1, 2017 at the age of 50 in Clearwater, BC. She was born in Kamloops, BC on December 5, 1966 and grew up in Blue River, BC. Donna was loved and admired by so many and will always be remembered for her beautiful smile and kind, giving nature. She was an active volunteer in the community, acting as treasurer for Scouts, Minor Hockey and PAC for many years. Donna loved traveling and spending time with her family. We are so grateful to have been able to share one last family trip to Mexico with Donna this past February. She is survived by her husband, Dean Sjodin; children Jesse, Jordan and Jo Akers; step children Bryson, Baylie and Kaycie Sjodin; parents Fred and Shauna Tourand; sisters Bonnie (Jeff) Ruttan and their children Beau and Bayley, Kari (Joseph) Daoust, Rhauna (Ryan) Mackenzie and their children Ashton and Ronnie; brother Reuben Tourand; and many aunts, uncles and cousins. all in our thoughts and prayers. Heaven has truly gained another Angel. Dan, Jesse, Jordon, Jo and families, I am so sorry and sad on the passing of Donna. Much too soon for you all! I worked with Donna for many years and she was a lovely, kind, considerate, patient and very intelligent woman. I have very fond memories of her. I do remember how impressed I was as she took to the new computer programs so well and shared her knowledge. The Ministry of Transportation and us employees did very well by Donna and I am grateful for her. I also remember your Mom at the Blazer hockey games Jesse, Jordon and Jo. You three were so young (and probably a handful) but she gave you wonderful adventures!!! I was so shocked and saddened to hear of Donna’s passing. My heart goes out to you at this very difficult time and I hope the many memories you have, and the love of friends, family and old high school classmates can give you strength and comfort in the days ahead.